Many people think about ocean animals when they imagine exhibits at the Aquarium — like sea turtles and stingrays and seals. But there are hundreds of freshwater animals at the Aquarium, too! 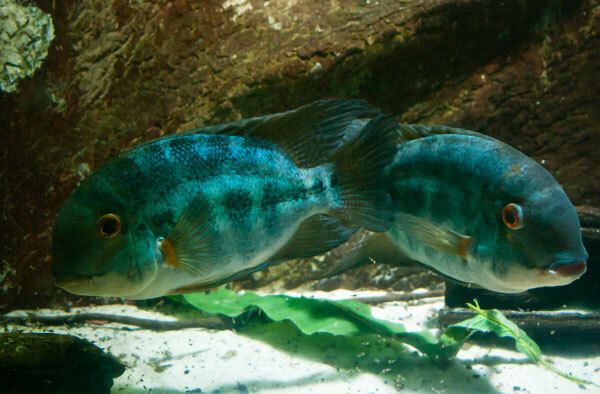 Explore the teeming Flooded Amazon exhibit at the Aquarium and you'll see animals of all shapes and sizes. The large window reaches almost to the floor, giving even the smallest visitors a great view of the exhibit. All the Amazon Rainforest exhibits together hold more than 4,500 gallons of water! The Amazon rainforest is one of the most diverse habitats in the world. The forests, rivers and lakes are home to uncountable numbers of species, including animals and plants that have yet to be discovered. The New England Aquarium’s Amazon exhibits feature hundreds of live plants and life-like fiberglass replicas of gigantic rainforest trees, vines and termite mounds. While families pick over leftovers and some brave crowds in the shops, we wanted to share a nice quite moment of zen from the... piranha. That's right, those toothy freshwater fish from the Amazon! 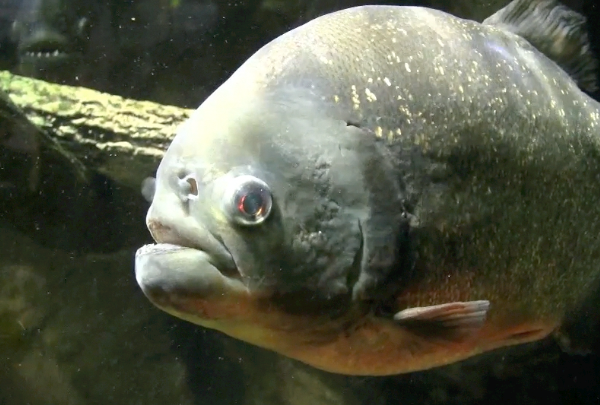 Piranha are often associated with feeding frenzies (and we're not talking about the Thanksgiving dinner table). But here at the Aquarium you'll find them peacefully swimming through their Amazon Rainforest exhibit more often than not. 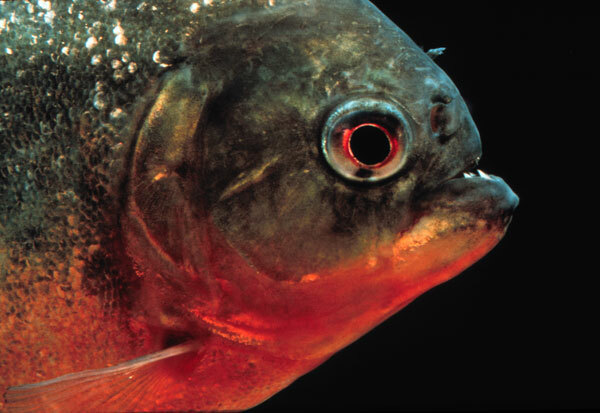 As we learned in this post, these red-bellied piranha (Pygocentrus nattereri) like to snack on insects, worms and small fish. They have been known to bark when there's competition for food, but most of the time they're very "well behaved"—as you can see in the video above! While friends and families across the country are preparing to feast on Thanksgiving favorites, let's take a moment to see how other animals eat. Even thought the Aquarium is closed for the day, Myrtle still gets to graze on squid and lettuce. The seals snack on herring, smelts and squid. Of course, the smaller animals eat, too. Just because they don't have teeth doesn't mean that sea jellies don't eat! This video shows beroe jellies eating other jellies. Watch how they swim along and engulf smaller ones. Once in their "belly," enzymes and muscular contractions help break down the food. Beroe jellies have been known to eat other jellies nearly half their size! 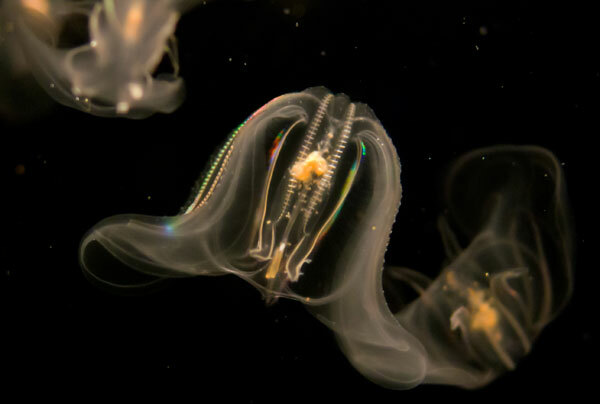 Comb jellies are also noted for the cilia, or tiny arms, which propel the animal through the water. The constant wave motion of the cilia give off an iridescent sparkle. Come by the Aquarium this weekend, perhaps the twinkle of the comb jellies will put you in the holiday spirit! There are thousands of marine animals around the Aquarium—some are small, some are shy and some have unusual lifestyles, at least by human standards. 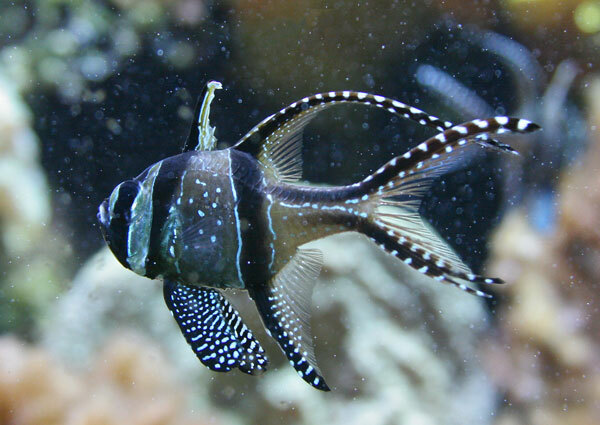 Take the Little Banggai cardinalfish, (Pterapogon kauderni), for instance. You can find this species in the “Living Corals” exhibit, (the tank closest to the Gift Shop on the first level). 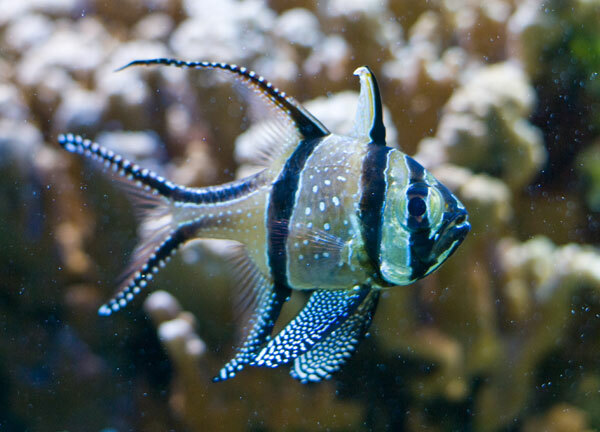 Native to the Banggai Islands of Indonesia, its good looks and ease of breeding make it a popular species in the aquarium trade. Popularity has also created a challenge for the species in the wild—it is currently listed as an endangered species on the IUCN red list. This is a small, but elegant animal. 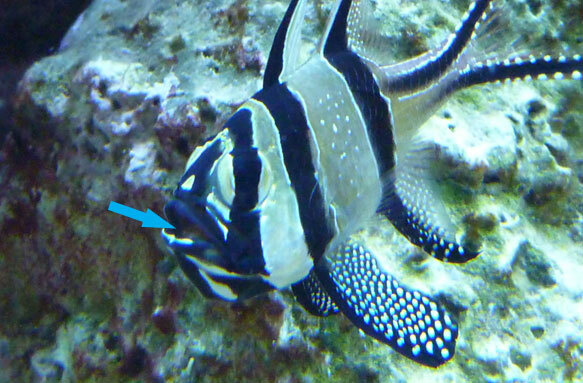 Look for the fish that appears to be ready for a black tie event, with his black stripes and dramatically forked tail. He sports a sequined gleam and stylishly tasseled fins, sprinkled with decorative white dots. 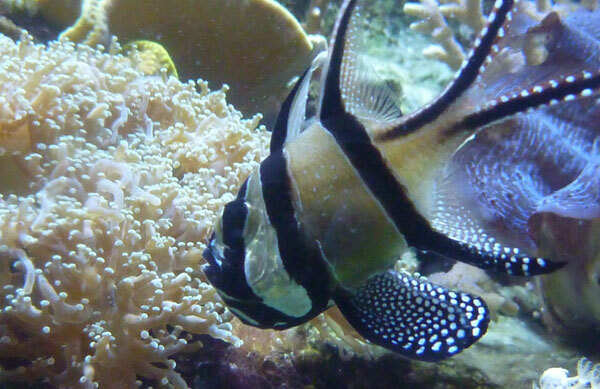 Practically speaking, the cardinalfish’s glamorous attire is suited to his life camouflaged amidst sea grasses, anemones and the long, black spines of the mildly venomous urchin, Diadema. Follow the arrow to see the eggs sitting in this father's mouth. Now look a little closer—he might not only be ready for a formal night out, he might also be ready for a visit to the maternity ward! If you see a fish with a distinctly larger jaw, you may be looking at a male brooding his young. He has a large oral cavity to accommodate the eggs and young that he nurtures attentively. In fact, this father doesn’t need the maternity ward for help birthing; he does just fine on his own. You may see him roll the pinkish eggs to rearrange and oxygenate them. Once the eggs have hatched you may even see some tiny eyes peeking out when the male stretches his mouth. As the fry grow and are more difficult to contain, you might see a flurry of fins emerging from the male’s bulging mouth. When his favorite food is presented in the exhibit, you may see him scurry—in the opposite direction! He doesn’t want to risk any of his young escaping his protection and becoming part of the food chain. In this way he protects his brood of up to 25 young for about 4 to 5 weeks, without ever taking a meal himself. Phew! After that, he might really need a night out! The aquarists who take care of this exhibit leave a fry collector in the tank overnight in the attempt to catch these babies. We'll update you more on these efforts another time. Stay tuned!